Journal of the Philosophy of Sport, 4:1, 36-49, (1977). Drew Hyland sets out to present a rather unique conception of ‘play’. His notion is that play is a kind of “stance” or attitude of “responsive openness” (38). So play is not, on this view, a particular kind of activity. Almost any activity can be play or non-play; what marks the activity as play is the presence of this stance on the part of the participant(s). So a basketball game can be play or not, depending on one’s attitude. Going fishing, doing the dishes, or doing philosophy can all be play or not (on the latter point Hyland has an interesting discussion of Socratic philosophy as a kind of play). What is this responsive openness? The openness is the heightened awareness of the environment/situation one is in. In playing chess, one is open by being acutely aware of the location of all the pieces on the board, their potential moves, and the time one has to move. The responsiveness is the willingness on the part of the participant to respond, appropriately, to what one is aware of in the environment/situation. One is responsive by responding to the opponent’s move of her bishop into a check of your king by moving the rook to block check. One fails to be open if they aren’t paying enough attention to be aware that his opponent is positioned to check your king and one fails to be responsive if he doesn’t appropriately move his pieces to prevent check. Hyland argues that play and non-play exist across a continuum depending on the amount of responsive openness in the activity (39). All human activities have some measure of responsive openness: walking down a crowded street would be quite difficult if wasn’t aware of his situation and respond to the objects in it. But as this responsive openness is turned up, we move out of non-play and into play. Obviously Hyland is not intending to draw any sharp distinctions between kinds of activities or between non-play and play. Nevertheless, it is hard to see how such a project will be successful. As Hyland notes, responsive openness on its own cannot mark out all and only play. There are other dimensions that need to be elucidated to identify more clearly what play is and what non-play is (even if it is along a continuum: even continuums can have demarcation points). Much of the rest of the paper focuses on two issues. (1) He wants to incorporate the idea of a stance of play with a Platonic notion of striving for completion of self. (2) He contrasts the stance of play with what he calls the stances of mastery and submission. These are interesting, but I am not going to say much about them here. One noteworthy aspect of his paper (especially for my research interest) is that Hyland doesn’t seem to see play as incompatible with productivity or compensation. He discusses, approvingly, a claim from Plato’s Laws that “the real opposite of play is neither work nor seriousness, but war” (44). Work it would seem, with the appropriate attitude or stance, is not incompatible with play. He doesn’t develop that here, but it is a difference between Hyland and other play-theorists such as Suits and Huizinga. I do think there is something to this stance conception. One can bring an attitude of play to nearly any activity (e.g. cleaning your desk becomes a race against an arbitrary and artificial deadline). Nevertheless, as presented in this paper, it is far too sweeping to be satisfying for me. Building off of Johan Huizinga’s account (read my review), Roger Caillois, in Man, Play and Games , introduces an expanded and more exhaustive account of play. Huizinga put forward the thesis of showing how culture and play interact, support and emerge out of each other. Caillois’ goal is different; he wants to provide an exhaustive, descriptive account of play in all its variations and forms. He starts by recapitulating Huizinga’s account and discussing what he regards as its short comings. According to Huizinga, play is a voluntary activity with fixed rules that create a special order residing outside the ordinary pattern of life. It is absorbing, with its own sense of space and time. Lastly, it is not connected to the achieving of any interest (external to play). It is too narrow, argues Caillois, because Huizinga’s account excludes types of play that are not based on rules as well as games of chance. Caillois distinguishes between rule-based games and make-believe. In the latter, rules do not govern or establish the play: instead the players play roles. The governing element is more an attitude or stance that players take to act as if they are someone other than what they are. These are clearly examples of play so ought not to be excluded from the concept. Since Huizinga regards play as incompatible with profit or the gaining of material interests, there is no room in his account of play for games of chance. Caillois seeks to remedy this by arguing that while play has to be unproductive, it does not need to preclude the players from exchanging property or wealth. The goal of play is not to produce anything: “it creates no wealth or goods…[it] is an occasion of pure waste” (5). The players’ attitudes, if they are indeed playing, have to reflect this as well. This serves to exclude professional players, such as pro athletes: “it is clear that they are not players but workers” (6). In games of chance, Caillois argues, there is no production, only an exchange of goods. These are zero-sum games, there is no productive value at all: hence the idea of pure waste. I think Caillois is right to point out Huizinga’s exclusion of games of chance; nevertheless, I am not convinced that play necessarily must be unproductive or that games of chance are necessarily zero-sum. Caillois does not argue for either of these claims (likely because many people regard them as truisms), but they require, I think, independent justification. Caillois goes on to introduce his definition and influential typology of play. His definition is that play is an activity that is free, separate, uncertain, unproductive, governed by rules and make-believe (9-10). They are free because they cannot be obligatory without losing their play-quality. They are separate in the sense of creating a special space and time (distinct from the mundane/everyday existence). They are uncertain in that the results or outcomes of the play are not known in advance or predetermined. They are unproductive, as indicated above, because they produce no goods or wealth. They are governed by rules that define the goals and appropriate means for these goals. Lastly, they involve make-believe because of the attitude players have to have towards the play: an acceptance of the special, created world of play. I’ve already noted my concern about the necessity of the unproductive. Certainly play is something that is a good in itself: it has internal goods that are the primary reason for participating and engaging in the play. But this does not exclude the possibility of external reasons as well. Many things can both be goods-in-themselves while at the same time still being constitutive of other goods. Another quibble is the manner which Caillois treats the issue of rule-governed play and make-believe. Moments before he introduces this list of essential attributes he claimed that play was either rule-governed or make-believe (9), but then he lists these elements as part of a conjunctive that makes up his differentia. Later, he clarifies these latter two parts by arguing that play is regulated and fictive (43). In this way, he avoids this problem. Regulation is not the same as rule-based: make-believe role-playing can be regulated by roles one takes on without explicit rules. Fictive gets at the important idea that playing requires one stepping into this special world; and this doesn’t necessarily imply an absence of rules. Though in this later presentation, he does tell the reader that these two aspects tend to exclude each other. Caillois’ definition, though, is not that different from Huizinga. What really marks out Caillois’ contribution is his classification of games. He divides games into four broad types: Agon (competition); Alea (chance); Mimicry (simulation): and Ilinx (vertigo). Each of these can range along an axis from what Paidia to Ludens. This range moves from something close to pure frolic (Paidia; lacking almost any structure or rules; the players’ attitudes are more exuberant and spontaneous) to highly structured (Ludens; more calculated and controlled; requiring much more precise and developed skill). So sports, being competitive, fall under agon. Casino games and dice playing are alea. The game of tag is a kind of mimicry (One pretends to be ‘it’). Lastly, ilinx are kinds of play, like whirling around or amusement park rides, where the goal is a momentary break from normal consciousness. Many games are a mix of these types. A game like poker involves both alea and agon: it is a competition requiring the developing of keen psychological skills but depends on the random distribution of cards. His definition and typology are also used to explain how play or games get corrupted. Essentially, play is corrupted as more of the rules, structures, and motivations of the non-play/mundane reality mix into play. Not surprisingly, the pursuit of profit is a major corrupting force. Professionals are a “contagion of reality” (45). It pushes aside, at least momentarily, the internal motivations and goals of play. Not just profit does this, but the bringing in reality in any of various ways can corrupt the play. Professionalism can also defeat the free element of play by making it obligatory to play on such-a-such an occasion. The inclusion of too much ‘reality’ can undermine the fictive element. Interestingly, Caillois also sees a parallel perversion that occurs when the blurring goes from play to reality. For example, he discusses superstition as the application of the rules of alea (games of chance) to reality. As a philosopher of sport, I am much more interested in the definition and typology than the sociological accounts of games (or how games inform sociology). No doubt this can be fascinating in many ways and of possible great worth for a sociologist or anthropologist. Nevertheless, I am not such how far an understanding of the play-elements of tribes that use masks for their sacred rituals can give us about contemporary games and athletics. This is not a criticism of Caillois or others who would extend this account. It is just a statement of (1) my own interests and (2) how far I think an over-arching, all-encompassing conception of ‘play’ can go. As far as (2) goes, I think Huizinga and Caillois are reaching too far into other areas for the concept of play. They are identifying categories of things that are closely related to play or play-inchoate. There is likely a more general concept that covers all these things, but they err in extending ‘play’ to cover all of this. Thus, insofar as one is trying to understand ‘play’ proper, this over-arching conception does not add that much. Caillois seems to suspect this as well: “The facts studied in the name of play are so heterogeneous that one is led to speculate that the word “play” is perhaps merely a trap” (162). Caillois’ book is an exhaustive, comprehensive, and structured account of play and its role in society and culture. It is an important work if one is interested in play, games, sport, or their interactions with society. I am deeply interested in the concept of “play.” I think it is important as a practical matter for children and adults to engage in play; and I think it is key for understanding different aspects our lives. It also connects in obvious and important ways to one of my main research focuses: the philosophy of sport. Ever since getting interested in the philosophy of sport, I’ve wanted to read Johan Huizinga’s classic Homo Ludens: A Study of the Play-Element in Culture . It is a fascinating book; wide-ranging, almost epic in what it attempts to cover. Huizinga attempts to elucidate the different elements and qualities of play in civilization and culture. He sees civilization and culture as at once emerging from a kind of play and as being a kind of play. He says: “genuine, pure play is one of the main bases of civilization” (5) and “[civilization] arises in and as play, and never leaves it” (173). So what is play? Huizinga does not provide a clear, simple to state definition. He does provide several essential characteristics of play. One, it is a voluntary activity; it is a kind of freedom. It has a dual sense of freedom: it is something freely engaged in and something that is an expression of one’s freedom. Two, it is outside the ordinary life. It is a kind of step into another world with its own rules and boundaries. My favorite example that Huizinga uses for this is the notion of a playground. He compares this to the sacred grounds or spaces of religions. A space, in all other ways similar to other spaces, marked out for a specific and special purpose. Third, play has its own space, and also its own time. Play runs its course: it has a beginning and an end. For many games and play, this time is not parallel to “real” time (think of how long two minutes in football takes to play). Fourth, play, through its rules, creates an order. For much play, the rules and the order they create are absolute. To break the rules is to destroy the order and the play. Lastly, it is connected to social and community groups that engage in the play. The features of special and separate space, time, and order create a paradox about play. Play is, because it is outside of ordinary life, not serious. Play, as it is conceived by Huizinga, is not engaged in to gain the values that one needs for life (it has its own internal ends). At the same time, play is not mere frivolity. It has to be taken seriously by the player. Within the game, the rules and the play are absorbing and near absolute. Outside of the game, these are arbitrary and even meaningless. It is this paradox, I think, that makes play so fascinating to think about. Huizinga’s first chapter digs into this paradox of play and seriousness, and he returns to it throughout the book. The middle chapters of the book are sweeping discussions of the different elements of play in different parts of civilization and culture (ritual, religion, philosophy, language, art, etc.). These are for the most engrossing and fun (sort of like play itself?). I cannot attest to the accuracy of his claims and accounts, and given their sweeping presentation I am sure there is some simplification going on, but it is worthwhile even if he may be somewhat inaccurate because it helps clarify the elements of play that he sees operating in culture. The last two chapters look at the modern world. Huizinga has some biting criticisms of the way modern culture has lost or perverted the sense of play. 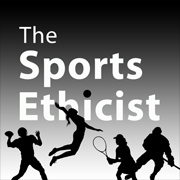 It is here he begins to address issues with direct relevance to the philosophy of sport. He sees contemporary sport as having lost much of the play-spirit that he thinks is so important to culture. It is, he claims, neither something completely seriously, nor is it play: it has become something of its own category. He also doesn’t think that sport of today is a “culture-creating activity” (198). I think there is some truth in his criticisms here, but I am not sure I would go as far as Huizinga. In part, the phenomenon of contemporary sport is still something very new in human culture. What its effects are and will be is still being discovered. I think this book is, for those interested in play, culture, or sport, an important work. I fear, nevertheless, that Huizinga is too far-reaching in thesis and sees play nearly everywhere. He recognizes this potential fault and tries to avoid it, but I am not sure he does. To the extent that he is identifying elements of play that are a part of the features of culture and civilization, I think his thesis is better supported. But to the extent that he is trying to make the case that civilization is itself a kind of play, I think his argument falters.